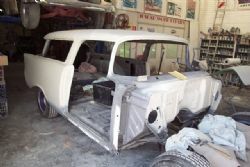 The biggest single expense of the entire Project Nomad restoration is the body and paint. It also will take the largest amount of time and will result in how Project Nomad looks initially and how well it ages into the future. I’d like to think that in five years time, road rash aside; it will still hold its own and have no visible signs of rust or deterioration if maintained properly. Getting the right body shop to do the job is very important. On the Classic Car Gurus website there are a number of outstanding body shops, all of which I have visited and seen the quality of their work. My final decision came down to the car I had, a 1957 Chevrolet Nomad and ideally I wanted someone who knew these cars which led me down the path to Joscar Smash Repairs in Revesby, Sydney. Joscar is a father and son team, Joe and Brian, and they are Chev heads. You know - eat, sleep, drink, think Chevs. They have a lot of cars that they own including convertibles, two doors and a Nomad ranging in condition from top shelf show cars to sometime in the future projects. Their specialty is tri five Chevs and I chose them because they know what they are doing, they can do all the bodywork and paint and have also done a lot of right hand drive conversions. On top of all that, they’re both really nice blokes who have a passion for the marque and are easy to talk to about what can and can’t (or shouldn’t) be done. There is no mucking around either – they are straight into it and have good relationships with other businesses in the trade that they know and trust. Once the Nomad came back from being blasted at Quik Strip in Bankstown and the guys had a good chance to see what they had to work with we had a discussion about replacement sheet metal, modifications and fabrication requirements and what was needed in sequence to ensure a smooth build. I fronted up to Joscar with two lower fender panels, the rear splash panel, inner and outer rockers, dash inserts and bezels and the couplings for the power rack and pinion steering. By this stage Joe and Brian had already chopped out the 57 dash, smoothed the firewall, fitted an electric two speed wiper set up inside the car and had it aligned and working. On a side bench the donor 56 dash had seen some serious action and was sporting a range of scars highlighting a number of modifications for the switch gear, instrument bezels and glove box lid enlargement. Not everything fits the way it should so with all the bits that will finally make up the dash Joscar are able to massage the components resulting in even gaps and flush fitment. 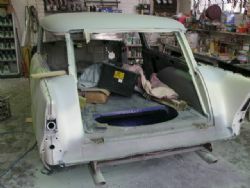 Once it is set up properly the pieces are welded in place on the dash and the dash is then welded into the car. Before the dash is welded into the car the vents and outlets for the climate control will be fitted and aligned which makes this job a lot easier than doing it later on. 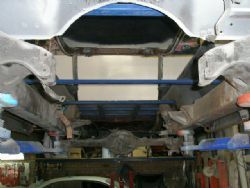 Once they are set up they can be pulled out prior to painting and just reassembled in situ when the whole car is reassembled. My last visit to Joscar saw Project Nomad on the hoist suspended about five feet in the air. It looked really weird because the entire floor from the bottom of the firewall to the rear splash panel had been cut out. 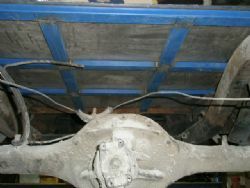 The wheels were off, exhaust gone and to support it a metal cage had been tack welded in spots to the inside of the body.